Friends, you are doing such a great job! I love seeing your homes and all the work you are putting into them! Today, we are going back to one of those things that can easily overtake our lives- papers! If you missed the post about decluttering our paperwork last week, be sure to go back and check it out. It will make completing today’s task much easier. Your family control center, or command center, is the place where you keep track of all your family happenings for the week. This can include your meal plan, shopping list, your finances and the general running of your home. If you don’t yet have a control center for your home, today is your special day! I didn’t have one for the longest time, but when I finally got around to it, I wished I had started far earlier! Now that your paperwork clutter is gone (right? ), it should be relatively easy to set up your control center. Once it is set up, there shouldn’t be too much work that goes into maintaining it. I usually take the last day of each month and plan out the following month, to the best of my ability. Granted, my month will not be planned out completely, but I try to note which activities we have and plan meals and household jobs accordingly. Your control center is what keeps your family on task- everyone should be able to look at it and see what you have planned. What do I suggest keeping in your control center? In future posts, I will be going over how to set up a cleaning schedule that works for your family, but for now, let’s just set up the control center so everything is ready to go. 1. Hang control center essentials in a central location in your home (I keep mine in my kitchen) so that it is easy and convenient for all family members to reference it on a daily basis. 2. Make a list of each household member and assign them a color on the board. Some people prefer to assign a color to each activity instead (red for sports green for chores etc) which is fine also. 3. Make a list of your family’s favorite meals and basic ingredients for those meals. Write down those meals on your calendar. 4. Create a cleaning schedule that works for you and your family. This is a good place to put your kids chore lists. 5. Fill in your calendar with any social obligations, extracurricular activities, appointments, tests, etc. Hang dry erase markers near the board, so it can be updated as needed. 6. Create a list of important phone numbers and notes, and post them on the board. Tell us, is this going to be a big change for your family? Have you used a command center before? 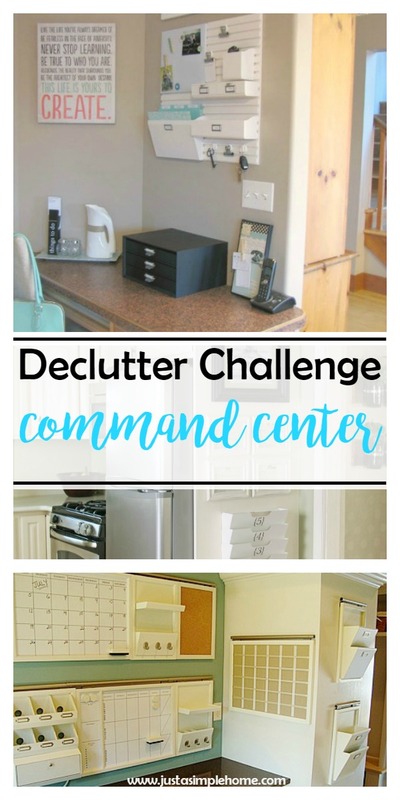 I love the term “command center” for this kind of station in the home! There’s just a simple whiteboard in the family kitchen at my parents’ place but it helps a LOT with making sure everyone knows what’s going on. Yes, same idea! I just find that one central location for all important things keep everything streamlined. These are such great tips!! Thank you for sharing!! This is so great! I need to do this with my life! I’ve been thinking so much about vertical organization so this was just in time! So helpful! I hate to admit that mine is not as organized as I’d like it to be, but now I can motivate myself to fix it! This is a great idea, and I love the look of your command center, too. I love the idea of meal planning with ingredients as well. Very smart! Aww, thanks! With a family of 8, meal planning needs to be a priority! I don’t have an organization center, but this inspiration definitely has me wishing I did! Love them all and I imagine it can only do good in our house! Let me know how it works out for you! It makes a huge difference in our home. We do not have room for a command center where we are now, but I do plan to have a space for one when we build our home. 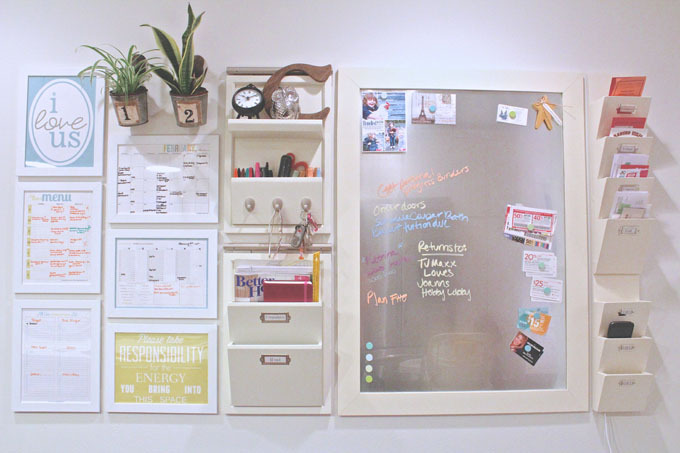 I love looking at these organized spaces on Pinterest! I am kind of intimidated by them, because they seem like they can get cluttered quickly. I have a very simple command center but I love having it! It’s so nice to have a place to write down what’s going on so my husband and I are on the same page. I use a white board and just change it from meal planning, to-do lists and a calendar for the week whichever is needed most! Casey, some people actually use a home binder just like a control center. You can put everything in a binder than you would in a control center and it saves the space! I tried to set one up in our front hallway, but it didn’t work very well. The kitchen is a great idea, and I’m going to try it there instead. This is so cute. I know for my family, it wouldn’t stay so neat and tidy for long. I love the idea of a command center! Our house does not have the space for one, which makes me sad! Wow I really wish I was this organized because this is absolutely fantastic. So is your command center set up? Is that one big piece or are there different hanging pieces that you put together? I can’t quite tell from the picture but it looks really neat!